Euclid is primarily a cosmology and fundamental physics mission. Its main scientific objective is to understand the source of the accelerating expansion of the Universe and discover its very nature that physicists refer to as dark energy. is it a new kind of field that evolves dynamically with the expansion of the universe? alternatively, is dark energy instead a manifestation of a breakdown of General Relativity and deviations from the law of gravity? what are the nature and properties of dark matter? what are the initial conditions which seed the formation of cosmic structure? what will be the future of the Universe over the next ten billion years? The imprints of dark energy and gravity will be detected from their signatures on the expansion rate of the Universe and the growth of cosmic structures using gravitational lensing effects on galaxies (Weak Lensing) and the properties of galaxy clustering (Baryonic Acoustic Oscillations and Redshift Space Distortion). Baryon acoustic oscillations provide a direct distance-redshift probe to explore the expansion rate of the Universe. Weak lensing provides an almost direct probe of dark matter but combines together angular distances that probes the expansion rate and the mass density contrast that probe the growth rate of structure and gravity. In contrast, redshift space distortion probes the growth rate of cosmic structures and gravity. Combined together these three probes are solid and complementary probes of the effects of dark energy. These observations will be complemented by independent observations also derived from Euclid data on clusters of galaxies and the Integrated Sachs-Wolf effect. They will be used to cross-check the results obtained from Weak Lensing, Baryonic Acoustic Oscillations and Redshift Space Distortion and to better understand and control systematic errors. Illustration of the primary probes of the Euclid mission. 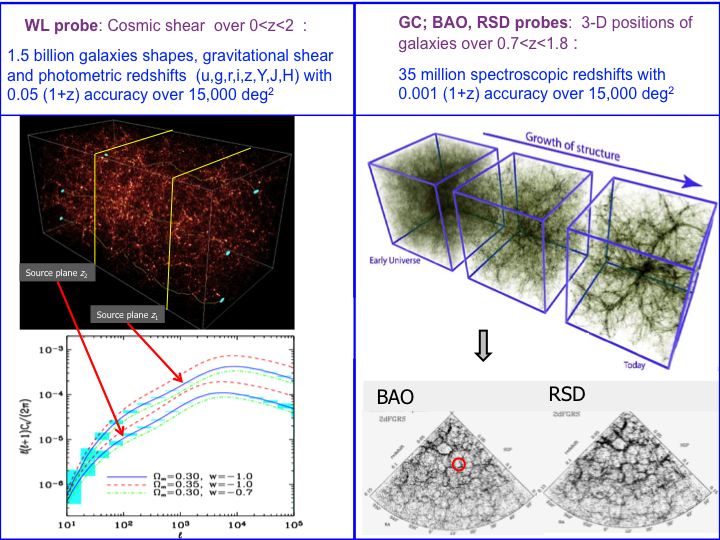 Right: Galaxy Clustering (GC), including Baryon acoustic oscillations, (BAO), Redshift Space Distortion (RSD). Left: Weak Lensing (WL)- Courtesy Euclid Consortium/Science Working Group.